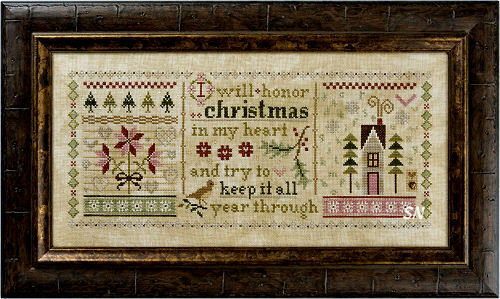 Such cute designs, these all feature a pre-made pillow or banner, or tons of little embellishments, to make them special. Seasonal and Holiday themes, the stand-ups are my personal favorites! If specially dyed linens or unique embellishments are an integral part of the kit, I've indicated it in my descriptions. Enjoy browsing! Spirit of Christmas Mystery Sampler! A quote by Ebeneezer Scrooge is the inspiration behind this sampler. 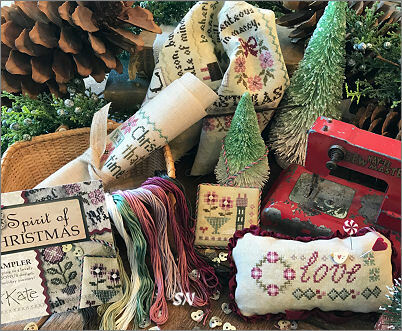 Originally presented as a 'Mystery Sampler' in three separate parts, we now have the complete chart collection of all the parts together, along with the official packet of charming buttons and beads. 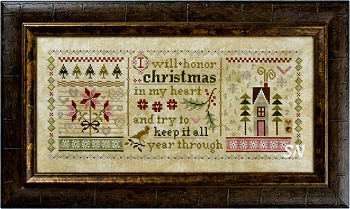 Stitched on 32ct Heartland linen by Picture This Plus -- any neutral color will work for this. Coded for Weeks or DMC floss, it finishes approx 95 x 191 -- or 6 x 12 on 32ct. Linda has included three bonus charts in here... they are NOT pictured and a total surprise to you! 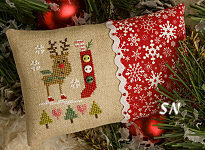 You're getting a double sided scissor fob, a pyn pillow and a mini sampler! 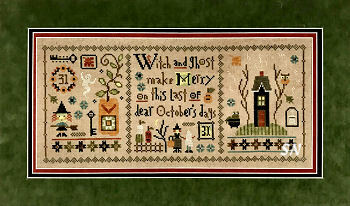 This 3-part sampler measures 227 x 97 and finishes approx 14 inches wide by 6 inches high on 32ct Ale by Picture This Plus. As with all the rest of Linda's Mystery Samplers -- you have lots of options for neutral fabric with these -- they look good on a lot of quiet colors. Coded for Weeks or DMC flosses, the bonus designs included with the 3-part chart set make a two-sided scissor fob, a skinny with stand-up piece, and a smaller elongated blackbird pin cushion. The official embellishment packet includes hand-made buttons and glass seed beads. Originally published as a mystery sampler -- we now have all three parts, the bonus pieces and the official embellishments all together for you. 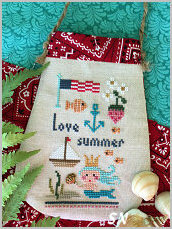 Our Wholesale Spring Market is coming in a couple of weeks, and Lizzie Kate sent out her teasers today!!! Here are the juicy details! Everything is due in the shop on Monday, March 7th, and we'll get it right out to you!!! 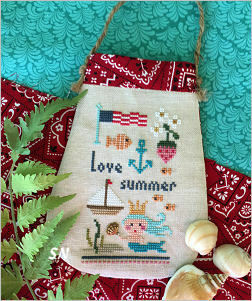 Love Summer -- A limited edition kit... this is just like Very Merry Santa and Hello Spring. A little mermaid in here, she's holding a shell charm. Kit includes 30ct Lambswool linen, classic bandana finishing fabric, twine for it's handle, and complete finishing instructions. BUT... finish it into a pin cushion if you'd rather not do the purse option. Flosses come from your stash. 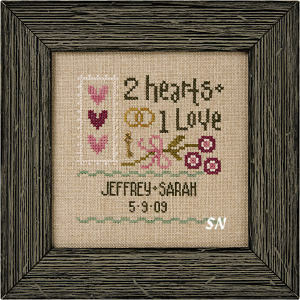 Another of Linda's smaller 3 x 3 designs, this joins the family of LITTLE kits of hers. She suggests changing the bootie colors as the girl/boy option. 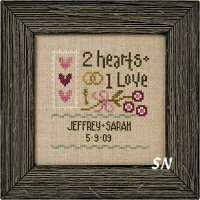 Offered as the chart with 28ct Lambswool linen cut and tiny brass heart charm. 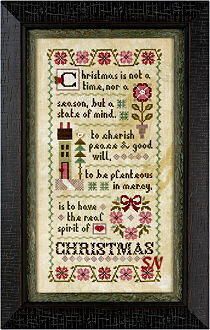 Scrooge was the inspiration for this piece... I think he did a good job! Finishing approx 14 x 6 on 32ct... the original was worked on Picture This Plus' Doubloon Linen. Choose any neutral you wish. Coded for Weeks or DMC floss, there is one tiny brass heart embellishment on here -- that is it. The small bonus designs in here are charming as well!!!!!! A 3 x 3-ish bitty design that celebrates any wedding special to you, this is offered as the chart with cut of 32ct Lambswool linen and a tiny key charm embellishment. You add bits of flosses from your stash. The featured couples these days don't want *too much stuff! 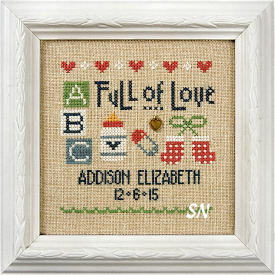 * They don't need a big family sampler to begin with... just this little token... just this little beginning. Save the big stuff for birth samplers! 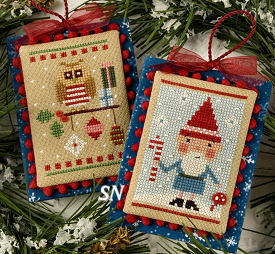 K71 Snow Dudes -- Two ornaments -- one is a Holiday Owl perched on a festive branch, and the other a Santa Gnome -- complete with red spotted mushroom button! 28Ct Lugana in the kit. 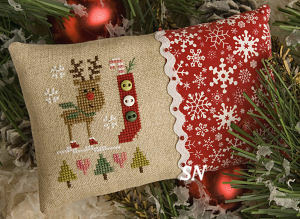 K73 Dear Rudolph -- is the most precious reindeer finished into a small pillow -- you get fabrics, beads and buttons, trims and the darling chart! 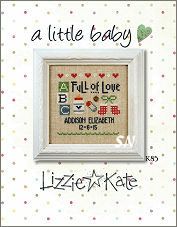 Lizzie Kate has a trio of limited edition small designs in chart/linen format... just as cute as can be! Chicks measures approx 4 x 1-1/2 and is stitched with bits of DMC or hand-dyed. Flowers has a count of 38 x 39... just a wisp of a thing... it'll take an evening to stitch. A Bee C finishes about 1-1/2 x 3-1/2... almost nothing to stitch! All three are colorful and full of LK charm... kind of a nice to have something small and VERY FINISHABLE in an evening... take 'em away with you for a weekend.. and get all three stitched! You'll feel *so good! * VERY cute, and VERY affordable! Each includes the chart, linen and embellishments. You add the needle and bits of floss. 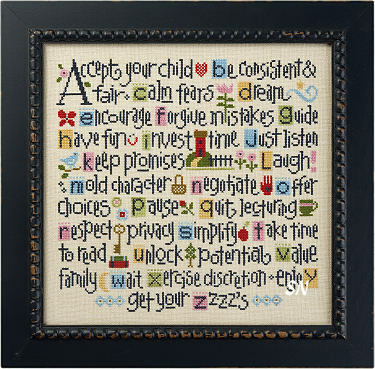 Wow... what a spectacular New Baby Gift, Shower Gift, or piece to stitch for any young family-in-training! (Actually, even the old families could use reminders sometimes!) Therapist Offices... A Daycare... the Baby Wing of the Hospital... Anywhere Children are important!!! Lizzie Kate has a new ABC Lessons piece -- this one directed at Mom and Dad! Calm Fears, Invest Time, Mold Character, & Wait... 4 of the ABC's I practiced just this week!!! This is an awesome piece... after you read it... you'll know it needs no more descriptions! Offered as the chart, you choose your background fabric. Finishing approx 10 x 10. Just makes a warm spot in your heart, doesn't it? ***NOTE: We are being treated to Just Another Button Company Clay Embellishment sets for ALL of Lizzie Kate's ABCs Designs!!! They all come with a line drawing for correct placement... so it's a breeze to make yours perfect! We do not have pics yet of all the models with their button sets... but the ones we have are awesome!!! This design is one that have been split into two small 'kit-lets.' Our very own Mona has finished the cover models, and Naughty or Nice (aka Santa Wants to Know) *HAS ITS OWN official Magic by Mona finishing kit! 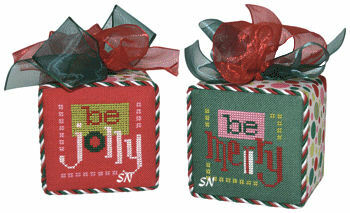 Naughty or Nice's stitched area finishes approx 4 x 4. All you supply are the hand-dyed flosses to stitch any of them.